It was one of the first stories any of us heard about the power of social media and how it was changing brands. In Spring 2008, Dave Carroll got off his United Airlines flight and found his Taylor guitar damaged. He spent nine months trying to get the airline to make it right, and in frustration he wrote a catchy tune and produced a funny YouTube video recounting his story. The rest is history. Or is it? Is "United Breaks Guitars" a lesson in how consumers are wresting control from brands, or just an entertaining tale? Has Dave Carroll's saga been repeated so often because it is a powerful omen of how brands must evolve or because that story proved to be a successful sales device, raising fears and encouraging the purchase of social media services? I have been asking these questions for years, but I think I finally got my answer Friday night at a terrific Ellis Paul concert where he described how United broke his beloved Taylor guitar and is refusing to pay for repairs. Déjà vu! We have come full circle, from one identical event to another. This furnishes us an opportunity to reexamine the "United Breaks Guitars" tale and what it really means to United Airlines and your brand. Before we get to Paul's recent experience, let's revisit why Carroll's 2009 YouTube video became such a legendary social media fable. 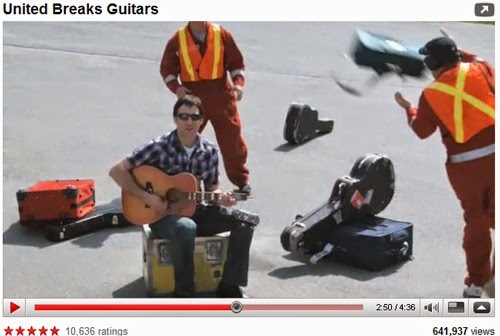 You already know the story, I'm sure; if not, search "United Breaks Guitars" for the 1.8 million(!) articles and blog posts on the topic. Each recaps how United refused to do right by Carroll until faced with an avalanche of bad PR in both social and mainstream media. It was only then that the airline was embarrassed into offering Carroll compensation. Had the story ended there, the moral would have been concise and accurate: One individual, given enough talent and creativity (plus, let's face it, a great deal of luck) can cause so much pain that a brand must take action. But that is not where the tale stopped. To professionals in the nascent field of social media (including yours truly), Dave Carroll was not just a skilled and creative guy whose unique talents and situation permitted a special way to elevate his gripe. He became, instead, a powerful everyman, effortlessly wielding free social media tools in the same way every consumer can. This single consumer's actions were inflated into an apocryphal lesson: "United suffered grievous brand damage thanks to the new power of Word of Mouth (WOM), and your brand will face the same fate unless you change (and buy our listening/strategy/consulting services)!" Did "United Breaks Guitars" Break United? For years, I have sought evidence "United Breaks Guitars" represented something more than one guy's creative solution to a customer service problem. Yes, United eventually acted to make the situation go away, but was the company really harmed and transformed due to social media WOM? If so, there is little proof. For example, the Wikipedia page for "United Breaks Guitars" suggests that United's stock dropped in the four days following the video's release. Of course, it is ridiculous to correlate a few days' stock variation to a single cause, and if you instead evaluate United's stock over a longer period, you find that in the six months following the release of Carroll's video, United's stock outperformed competitors' by more than 100%. Not one person has yet fessed up to altering their purchase behaviors as a result of seeing the video. You're not surprised, are you? After all, you saw the video and did not change your airline purchasing habits, either. In the end, we all buy airfare the same way, choosing whichever carrier offers a route from Point A to Point B that is cheapest, easiest and provides the right loyalty miles. If we hate and avoid United, it is because of our own experiences and not because of a YouTube video. There is no sign that "United Breaks Guitars" impacted consumer behaviors or hurt the airline's business, but did that video affect changes within the company? That is the claim oft repeated: United learned its lesson and transformed itself! As conveyed in the book "Empowered" by Josh Bernoff and Ted Schadler, "United has changed its policies. Baggage claim agents now have a little more discretion with customers whose special situations warrant the company looking into the claim more closely; United uses Dave Carroll's video in it's training." By repeating the story of how United had learned and transformed, were people like Josh, Ted and I (and many others) redefining the way companies must operate in the social era? Or were we merely cogs in the United Airlines PR machine, helping to turn an embarrassing brand situation into a positive corporate message? Ellis Paul's recent United experience makes it clear which is the truth. Ellis Paul is one of my favorite music artists. I regularly listen to his folk-pop music while working and commuting. Paul is a terrific storyteller, an amazing songwriter, and he performs with a passion and wild abandon that I find breathtaking. His songs, such as Maria's Beautiful Mess, have appeared in more than 50 compilations and movie soundtracks such as "Me, Myself, and Irene" and "Shallow Hal." Last month, Ellis was flying to a show in Portland. He got off his United flight and found that his expensive and beloved Taylor guitar, nicknamed Guinness, had been cracked in transit. Paul did what any of us would do in the same situation; he posted on Facebook, filed a claim and wrote the president of United. In response, Paul received a call from someone in charge of baggage handling in Portland, but all he offered was an apology. United will not pay for the repair, which Paul estimates will run around $1,500. This is not a mere possession to Paul. He didn't find Guinness; the guitar found him. Paul borrowed it while performing at the legendary El Reno Vintage Guitar Shop, and you can see his first performance with the magic guitar on YouTube. As he tells the story, he had no choice whether to buy the expensive, beautiful instrument. Even though it is now damaged, Ellis continues to perform with Guinness, duct tape covering the crack caused by United's baggage handling. That will do for a while, but it must eventually be repaired. Paul's 2014 situation could not be more identical to Carroll's 2008 United issues, and the airline is dealing with it in exactly the same way. If United learned a lesson, changed its policies and revised its training, there is absolutely no evidence. Given the chance to prove how it transformed, United has failed. Just as it did five years ago, the company is "handling" the situation, not resolving it. With Ellis Paul's United Airlines disappointment, we have come full circle in the social media hype cycle--two duplicate events separated by six years--only this time we do not have to buy the hype. We may have believed that Carroll's experience transformed United, but Paul's experience demonstrates otherwise. The most provocative question is not whether United was transformed by social media, since it clearly was not, but why not? As social media pros hype the transformative powers of WOM, one of the things they conveniently omit is that offering better service to customers costs something. In many cases, investments in better service and improved WOM will provide a return, but that opportunity is far from universal for every brand in every category. United could immediately pay every damage claim (or offer more legroom or give every flyer a free alcoholic beverage) and generate a lot of positive sentiment in social media, but that would also increase costs and prices. It really comes down to financial calculations: By treating customers better, will positive social media attract more customers despite higher prices? By treating customers badly, does negative WOM result in lost customers despite lower prices? United doesn't need to wonder the answer to these question; it got its answer back in 2009 when you, I and everyone else watched "United Breaks Guitars" and changed absolutely nothing about the way we purchase travel. The fact United has not changed its practices is not because it does not care but because we do not. Social media changes nothing by itself; if consumers are not willing or able to change their spending habits, then social media crises like "United Breaks Guitars" will always be more smoke than fire. This is not to say that WOM is never powerful, but that its power is not uniform. How often have you searched for customer ratings of airlines in the past year? And how often have you sought customer ratings for hotels? Your very different answers to these questions are why hotels thrive or struggle based on WOM and airlines do not. Because consumers probe online reviews when making lodging decisions, WOM matters; one study found that if a hotel increases its rating by one point in Travelocity’s five-point rating system, the probabilities of being booked increase by 14% and price can be increased by up to 11% without affecting demand. There is the power of WOM for you! Social media professionals need to stop believing every story told by brands and bring greater critical thinking to our field. "United Breaks Guitars" was not a social transformation success but a PR success: Dave Carroll became an author and public speaker, and United's PR team turned a painful PR problem into a wonderful--and fictional--story of transformation and customer commitment. The fact "United Breaks Guitars" was inflated into an endlessly repeated cautionary tale for every brand says more about the social media industry than it does about WOM. The way brands treat customers in the real world has far more impact on WOM than what they do in social media. United's problem was not that it failed to reply appropriately in social media but that it did not treat Dave Carroll right from the start. Once he launched that video and it began to accumulate hundreds of thousands of views, it was too late for United--no social media strategy or program could save the company at that point. Listening and responding to customer needs in social media isn't transformative but business as usual. Any brand of sufficient scale will see hundreds of tweeted complaints; that is business as usual, and those tweets need a business-as-usual response, the same as you would manage the same inquiry via email or on the phone. Social media can prove transformative for companies, but only if it changes the way they operate. Merely responding to consumers on Twitter is not a transformation; it's just good, smart business. There is an exception to every rule, and that exception sometimes demands special treatment. Every now and then, a single customer can rise above the noise and generate enough attention to force a company to take special action. The reasons may have less to do with WOM damaging business and more with the fact these rare situations increase customer service costs, consume time from PR executives and interfere with the company's ability to deliver its intended PR and marketing messages. This is no different than in the past--businesses have always treated important or influential customers differently--but today someone can gain influence through the right combination of skill, talent, creativity, luck and perseverance. YouTube, Twitter and Facebook are littered with millions of customer gripes, and not all demand the attention that Dave Carroll got. He was not a famous musician before "United Breaks Guitars," but United made him a star, and that's why he eventually got more attention from United than many others who have since attempted the same thing. If you are so inclined, please tweet @United and ask them to do right by @ellispaulsongs. With your help, we can get United to do right by one musician and get one guitar repaired. I have no illusions that spurring United to action will mean anything more than an appropriate resolution to one customer situation. If they respond, it will not represent a new paradigm, nor will it mean United has become a new and better company. All it will mean is that one worthy musician got what he deserved from a large corporation. And if you will not do it for me or Ellis Paul, then do it for United. Ellis knows Dave Carroll and is preparing his own YouTube song with the hopes it becomes "United Breaks Guitars, Round 2." Perhaps a few tweets of pain now will prevent United from a great deal more pain later. Better United hears from you on Twitter today than read about it on CNN or HuffPost a few months from now!
. @united @ellispaulsongs went thru normal channel; got apology but no offer to pay for repairs. Do you really want United Breaks Guiters 2? Déjà vu? 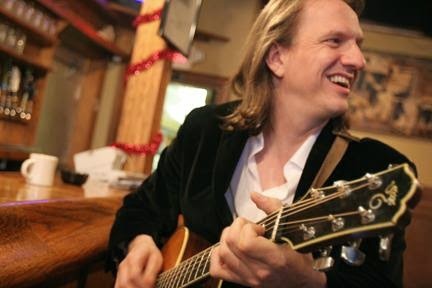 @united broke but won't repair @ellispaulsongs' beloved guitar. If you think they should, please RT. Please RT to let @united know they should repair @ellispaulsongs' guitar. Why is doing the right thing so hard for some brands? Interesting perspective. I never thought of "United Breaks Guitars" as an example of changing brand behavior but more an example of how a customer now has much more power to embarrass a brand and get results (whereas before you had zero chance). I don't think, however, the airline|hotel analogy is terribly strong. I think a main reason customers don't change their airline behavior isn't because they don't care but because there are very few options. With hotels, customer feedback (i.e., reviews) are more helpful because most of the time there are at least 2-15 comparable options just up the street. This, of course, goes back to the power of social media. Because online reviews are changing customer behavior (a la hotels); just not, perhaps, customer airline behavior. Good post; it is important to understand what lessons we can take from "United Breaks Guitars" -- while being careful not to ascribe to Dave Carroll's story something bigger. I agree with Daria on the hotel/airline comparison. When flying on personal trips, i for one DO check airline reviews extensively and also look at their social activity to see how they handle folks on social. Daria, I agree with your perspective on this. In fact, 18 months ago, I wrote a blog post where I spoke about where sentiment is stronger and where it is weaker in affecting purchase decisions, and I allude to the limited choices and general level of service parity in airlines being a problem (http://www.experiencetheblog.com/2012/11/how-powerful-is-social-media-sentiment.html). That said, I still think many flyers have options and convenience and price still trump. I just checked EWR to Chicago; one can fly Delta or for $30 more fly Southwest. Despite Southwest's great reputation, my guess is most folks would opt to save the $30. I think we're both saying the same thing at some level: We have to look at where consumers are willing to able to switch, because if they are not or cannot, then WOM is not as vital. Good post, we need to become realistic about the limited power of social media. When it reflects a ground swell of opinion, smart brands will change practices. Otherwise it is a customer service issue requiring a tactical and not a strategic resolution. We tout isolated cases as game changers and they rarely are. The story about Morton steaks delivered to airport arrival after tweet is another red herring - was just a PR stunt. Terry, I love Peter, but I hate that damn Morton's story. What a crock--as if brands needs to chase consumers (or influencers) around showering them with free stuff and that will somehow pay off in better business. I'd suggest that few to no people ate at Morton's because of Peter's tweet, just as few to no people stopped flying United because of Carroll's video. You are absolutely correct. We have and continue to be amazed of "game changers," when we really just need to operationalize social. Not a game changer--just another important, boring channel. I'm hoping Ellis Paul gets United to fix his guitar and wonder if he has gotten a more appropriate response with the volume of his complaint "amplified" by social media. Most companies will not address their core customer service issues because of pressure via social media, any more than they have made these fundamental changes in response to being called to task by legacy media or, for that matter, lawsuits. You wrote, "Social media professionals need to stop believing every story told by brands and bring greater critical thinking to our field." I think that could be extended to, "Social media professionals need to stop believing every story told by many of their peers and bring greater critical thinking to our field." The "United Breaks Guitars" story reminds me of the angry groundswell that erupted on social media in the aftermath of the BP Deepwater Horizon oil spill in 2010. Here was a far more serious incident than United Airlines breaking someone's guitar. Four years later, I'm hard pressed to find any evidence that our public venting on social has had any impact on BP's practices (aside from BP embracing social media more aggressively to defend itself). The fake @BPGlobalPR Twitter account continues to skewer BP and has 134,000 followers as of June 2014, but to what end? Another good discussion. I agree w/ you Augie.. doesn't matter so much what USAir tweeted (by accident) or how offended you are by someone's social practices (if you even know of them, most people I know really don't pay that much attention), price usually wins. Daria is also right about the limited choices playing a factor, when there are more options we do shop around and compare value in terms of cost/quality vis a vis reviews, WOM. Travel is a good example for that reason. Yes Hotel A may get gangbuster reviews but then, it knows that and charges accordingly. I rarely spend that much time in my room, so I roll the dice w/ Priceline and Hotwire for a much better deal on a slightly less popular hotel. Re: saving $30.. only catch w/ your example is (ugh) bag fees. Now that SWA is in ATL even if the fare is a bit more than Delta, when I subtract the checked bag fees I almost always still do better on SWA. FWIW. Dammit, David, you have literally stolen a paragraph out of a blog post I have in progress. I am working on one tying all the "good" stories in the early days of social (Dell, Comcast, Einstein Bagels, etc.) and the "bad" ones (United, Dell again, Bank of America) to make a broader point about how little impact we are seeing. And I was using BP as my punchline--even if you take it out of mere "social PR crises" and into the realm of "real global disasters," it is tough to see the impact (beyond the actual cost to BP of fines and cleanup.) Great minds thing alike! Your point is a great one, though. The message of WOM is that people care. But do they? How many stories about low-wages and employees despoiling ingredients have we seen in the fast food vertical--and how is fast food doing? How many stories of shipping workers tossing people's packages around? How many stories about poor customer service? And... where are the profound impacts we said would occur in the social era? It's a realization those of us in the social business may hate to admit, but WOM is only as powerful as people's ability to care. While it once seemed powerful, companies are catching on to the slacktivism common in social media. "Yeah, I want to RT and embarrass United because they treated a musician badly, but I'm still not going to spend $30 more or drive 90 miles to another airport to avoid flying on United." I think social can be powerful for small brands (both positive and negative), but I truly am struggling to see where social has the impact we claimed on national and global brands. That said, I always have to end a discussion such as this by saying social is still important. The combination of digital, social and mobile are changing the way people evaluate products, the way companies furnish service and products and the way we collaborate around both ideas and consumption. Those are powerful forces, but WOM griping on social is a LOT more smoke than fire. Thanks for the addition to the discussion! the good news is that we now have more power to penalize bad business but this power is fluctuating and rarely changes anything. Augie, This would make a great Hangout debate/discussion. This thread makes for a fabulous review of the effect of social media for brands. It certainly does not carry the stick we once assumed nor the carrot. It is however where people spend time and speak about their experiences, even then, most brand experiences are trivial compared to any family or personal news. Is it destined to follow the same route as other mediums? People are there and can be clasified by desires, age, income etc. It makes for a very good ad platform and that is what more brands see it. Brands place ads but are there to receive comments, complaints and questions. It would make a simpler relationship, no more cat gifs just well targeted ads. And we can forget this concept of fans and followers, convinces marketers that people love them. There is no truer statement than your comment, "we should penalize bad business with our wallet, but we can't always afford to do it." I'd add that "afford" means different things, not just price. It also means the hassle of switching, the cost of dealing with an unknown or unfamiliar brand and the emotional cost of parting with a comfortable brand. There are lots of reasons that WOM cannot easily sever existing brand relationships. As for your comment that "we don't really know how social media works," I don't disagree, but let's be honest, that is simply the nature of marketing and brand communications. There is no science--the best and most expensive marketing campaigns in traditional channels can fall flat, and then some dumb ad (remember the annoying Head On ads--https://www.youtube.com/watch?v=Is3icfcbmbs) can become viral. I sometimes think marketers have been goaded by demanding CEOs, CMOs and investors into trying to refashion marketing as a science. Yes, there is much of marketing that can be data-driven and highly measured, but the further you get from direct marketing (and the more one focuses on building a lasting brand) the harder it is to see marketing as a science. That's my way of saying that perhaps it is okay that we don't know which posts will go viral and which don't--because consumers are humans and not machines, which is why, despite any scientific and logical assessment, Chocolate Rain, Gangnam Style and Harlem Shake became memes and thousands of other videos did not.